In its genesis, Gigapan took us to the cosmos to show us something we had never laid eyes upon before. In its commercial iteration, Gigapan has allowed us to expand our view and discover remarkable details that, even with the naked eye, were often hidden. And into the future, Gigapan will give us the opportunity to broaden our own personal vision by empowering us to create, share, learn and engage more than we could ever imagine. The updated Gigapan logo references the form of the panoramic image in the stylization of the letterforms to create a frame. It is deliberately understated and sophisticated, allowing photographic imagery to come to the foreground rather than competing with it. A large part of the Gigapan experience is its massive website which serves up thousands of gigabytes of photographs, user information and resources, as well as a full e-commerce platform. Redesigning the UX of the site was a priority in order update faulty code, launch the new visual expression of the brand, and to make the experience more useful and pleasurable overall. Extensive interviews and work sessions were part of the process to unearth the core history and intentions of the company. One of the main drivers of the brand was the establishment of the archetype by which all messaging and strategy would be led. Combined with business strategies to move into the future, a landscape of consumer profiles was key to creating a messaging platform and approach for the new brand. The establishment of company and brand values was one of the final keys to creating a complete messaging platform, design and experience principles, and vision/mission/positioning documentation. 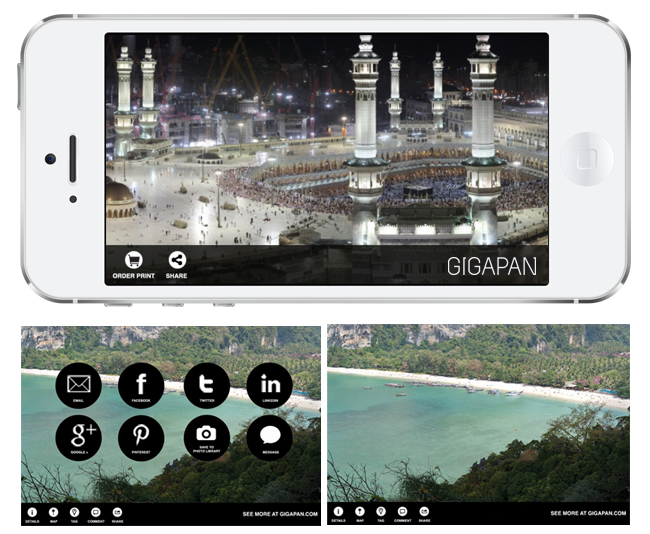 One of the most important parts of the Gigapan experience is the viewer itself which is available online, but also on a number of different mobile platforms. A series of A/B tests revealed insights that would guide the design of the interface, the strategic placement of buttons and information, and the crafting of the code to scale a variety of viewing scenarios, all with speedy downloads.